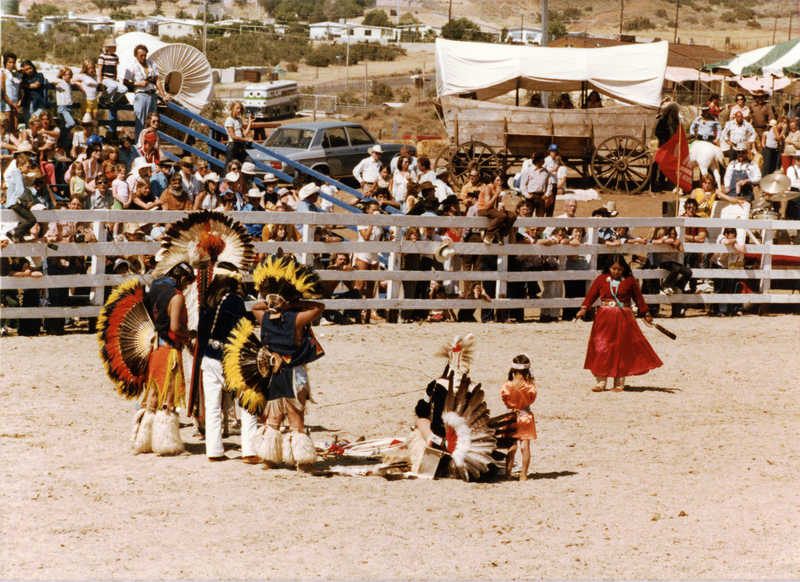 SCVHistory.com LW2953 | Film-Arts | Benefit Wild West Show & Powwow at Montie Montana's Agua Dulce Ranch, 6-25-1978. 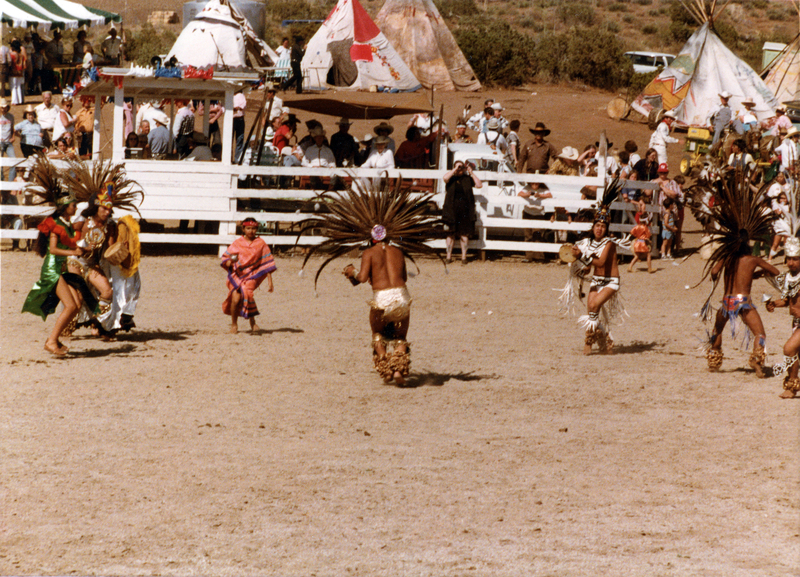 June 25, 1978 — Wild West Show and Native American powwow at Montie Montana's ranch in Agua Dulce. Benefit for Hope Ranch, a nonprofit in the state of Montana that houses and helps abused Indian children. Montie moved in 1976 from a ranch in Northridge (Devonshire Downs) to the northeast corner of Agua Dulce Canyon Road and Escondido Canyon Road, across Escondido from Vasquez Rocks County Park. Two 5x7 photos by Bob Plunkett, P.O. Box 54 Amb. Sta., Los Angeles, CA 90070. From Montie's personal collection. Ex-Butterfields 2000, ex-EarthHunt. Monty [sic] Montana to Stage Show. Los Angeles Times | Sunday, June 18, 1978. Agua Dulce — A benefit Western show and Indian powwow will be staged by entertainer Montie Montana at his rodeo ranch in Agua Dulce from noon to dusk Sunday, June 25. Proceeds will benefit abused Indian children. Admission is $10 per car. The Montana Ranch is at 10240 Escondido Canyon Road, north of Highway 14. Cowboys, Indians Ride to Aid Kids. By Ken Lubas, Times Staff Writer. 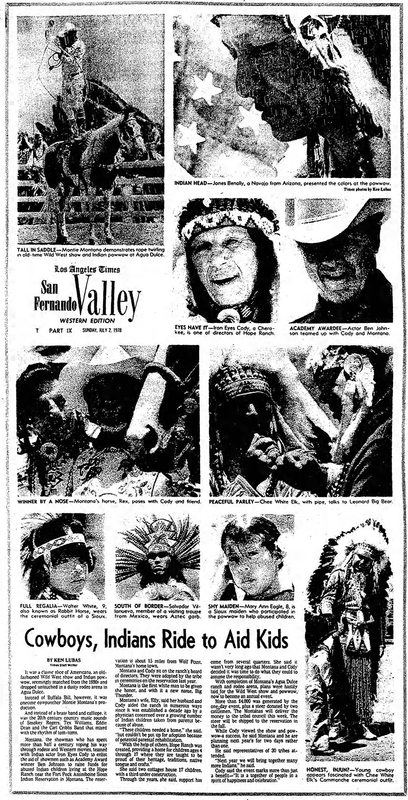 Los Angeles Times | San Fernando Valley Western Edition | Sunday, July 2, 1978. It was a classic slice of Americana, an old-fashioned Wild West show and Indian powwow, seemingly snatched from the 1890s and dropped untouched in a dusty rodeo arena in Agua Dulce. Instead of Buffalo Bill, however, it was onetime cowpuncher Montie Montana's production. And instead of a brass band and calliope, it was the 20th-century country music sounds of Smokey Rogers, Tex Williams, Eddie Dean and the Carl Cribbs Band that mixed with the rhythm of tom-toms. Montana, the showman who has spent more than half a century roping his way through rodeos and Western movies, teamed with Indian actor Iron Eyes Cody to enlist the aid of showmen such as Academy Award winner Ben Johnson to raise funds for abused Indian children living at the Hope Ranch near the Fort Peck Assiniboine Sioux Indian Reservation in Montana. The reservation is about 15 miles from Wolf Point, Montana's home town. Montana and Cody sit on the ranch's board of directors. They were adopted by the tribe in ceremonies on the reservation last year. 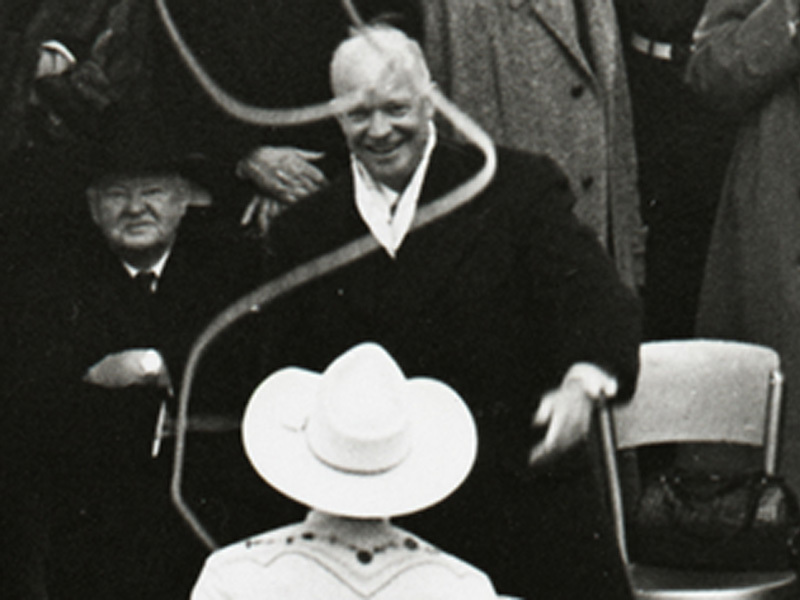 Montana is the first white man to be given the honor, and with it a new name, Big Thunder. Montana’s wife, Elly, said her husband and Cody aided the ranch in numerous ways since it was established a decade ago by a physician concerned over a growing number of Indian children taken from parents because of abuse. "These children needed a home," she said, "but couldn't be put up for adoption because of potential parental rehabilitation. "With the help of others, Hope Ranch was created, providing a home for children ages 4 through 17 where they are taught to be proud of their heritage, traditions, native tongue and crafts." She said two cottages house 17 children, with a third under construction. Through the years, she said, support has come from several quarters. She said it wasn't very long ago that Montana and Cody decided it was time to do what they could to assume the responsibility. With completion of Montana's Agua Duke ranch and rodeo arena, plans were hastily laid for the Wild West show and powwow, now to become an annual event. More than $4,000 was generated by the one-day event, plus a steer donated by two cattlemen. The Montanas will deliver the money to the tribal council this week. The steer will be shipped to the reservation in the fall. While Cody viewed the show and pow-wow a success, he said Montana and he are planning next year's for two days rather than one. He said representatives of 30 tribes attended. "Next year we will bring together many more Indians," he said. Cody said the event marks more than just a benefit — "It is a [get]-together of people in a spirit of happiness and celebration." LW2953: 9600 dpi jpeg from original photograph purchased 2017 by Leon Worden from EarthHunt.